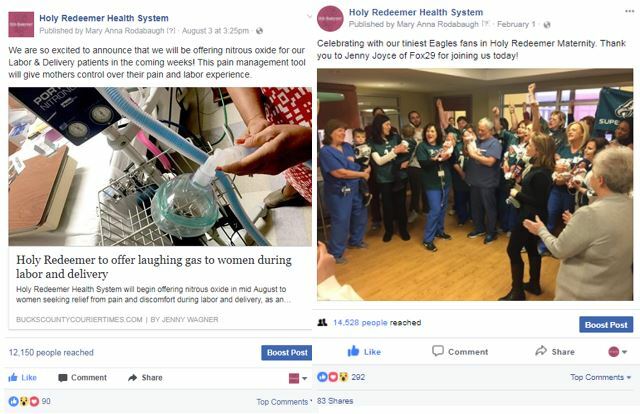 Content marketing featuring informational and emotional posts, like these from Holy Redeemer Health System, can help turn consumers into patients, and even brand loyalists. There are many avenues to turning consumers into patients, but one of the best is to connect with them through your digital content marketing program. Reaching them on the platforms they frequent, and providing both useful information and content that resonates emotionally can support your organization’s business strategy while building loyalty. Simply put, creating content that does your advertising for you is smart brand strategy. A recent NESHCO (New England Society for Healthcare Communications) webinar, presented by digital strategists with S/P/M Marketing & Communications, peeled back the layers of a successful content marketing campaign. Like everything else when it comes to crafting a marketing campaign, research, planning and honing your strategy are vital first steps. Before launching your content marketing activities, devise your strategy. It was noted that content strategy is based on your research-driven internal communications foundation, and represents your vision and mission. Content marketing, on the other hand, is focused on external communications, should drive consumer engagement, and puts a premium on measurement and analytics. Out of your strategy will come a long-term plan that aligns with your business goals, and better understanding of what kinds of content will work best for the organization. Who makes up our target audience? Where to they like to get their content? Don’t worry about being on all or even most of the the big social media channels; identify those where your audiences are and which will work the best for achieving your goals, and focus on them. Utility – Useful/actionable information that makes life better or easier, presented in an easily digestible way, including factoids and infographics. Emotion – Content that triggers an emotional response. Entertainment – Content that entertains in a clever, humorous or attention-grabbing way. The strategic use of your content franchises will help you shepherd your audience from passive consumers to brand advocates. This consumer journey comprises Awareness, Consideration, Decision, Loyalty, and finally Advocacy. Public relations, paid advertising, SEO, owned media (including your website), boosted content and word of mouth all play a role in this evolution, but valuable content is the throughline cutting across all of the phases. Compelling testimonials, for example, can move someone from consideration to decision. Powerful patient success stories can build loyalty, as people want content that validates their decision. Repurposing a single piece of content for various digital assets can extend its shelf life, but planning for that upfront is key, so you don’t have to retrofit. Use editorial calendars to plan content well in advance. Determine your “voice” (conversational, authoritative, friendly, etc.) and stick with it. Consistency in voice, tone, and style across all your content is very important. Make sure your website is optimized for mobile. Mobile users surpassed desktop users two years ago. Incorporate SEO in your content strategy. Content will impact your SEO, and vice versa. Authentic imagery works better for building connections than stock art. When using video, keep it short (under 90 seconds), and showcase emotion or a service that differentiates your organization. Creating a content marketing campaign requires legwork up front, and ongoing diligence to ensure your messages support your business goals and are being received. But the payoff both in patient converts and your organization’s reputation is well worth it.